This post is in partnership with CHI-CHI's®. Thank you for supporting the brands that help make Bubby and Bean possible. When it comes to food, if there is anything I've learned in my home, it's that I cannot go wrong with making quesadillas. I mean tortillas and melty cheese are pretty much the perfect combination and most people I've met, regardless of age or culinary preferences, love a good quesadilla. I have experimented with making all sorts of different quesadillas over the years, from simple cheese varieties to heartier, more unique creations. 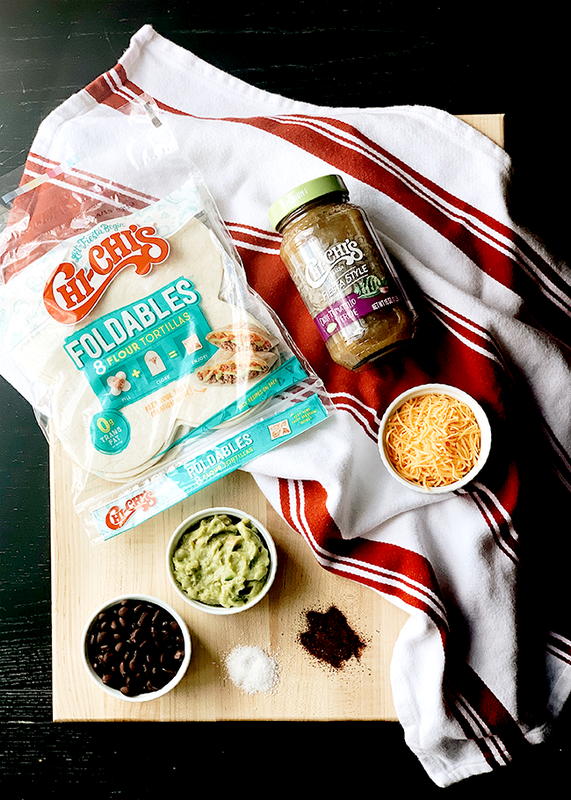 And today, I want to share with you my current favorite, which is deliciously filled with black beans, cheddar cheese, and flavorful salsa verde, all wrapped into the tastiest and most convenient tortilla wraps: CHI-CHI'S FOLDABLES® Tortillas. My kids absolutely adore the fun shape of the wraps; I love how they keep all of the ingredients inside instead of spilling out all over their clothes and my floor. But it's the fresh, tangy flavor of the CHI-CHI'S Fiesta Style Chile Tomatillo Verde Salsa that makes these so delightful. 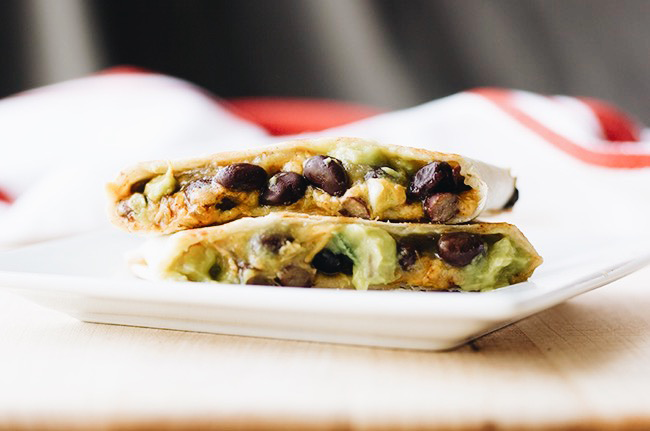 These super satisfying quesadillas are perfect for meals or filling snacks. I think you'll love them as much as we do! In a large skillet or griddle, melt the coconut oil over medium heat. 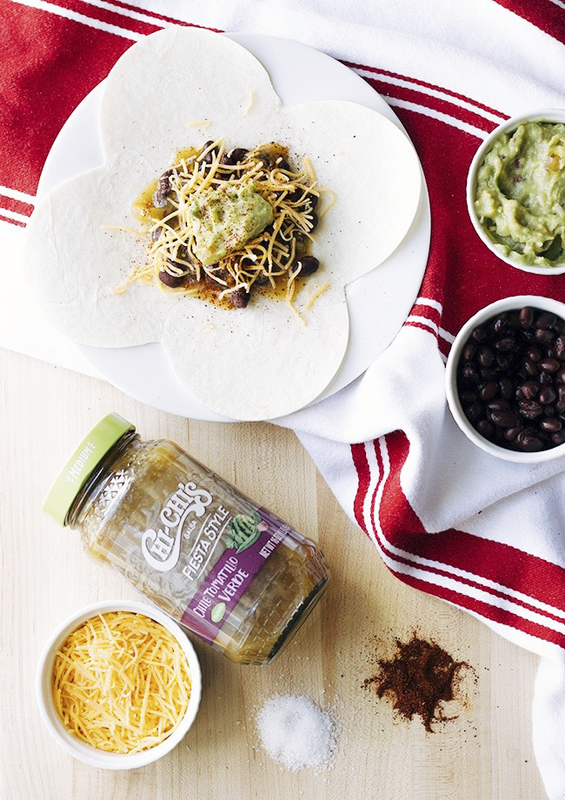 Place CHI-CHI'S FOLDABLES® Tortillas on a flat surface and top each one with equal amounts of cheddar cheese, black beans, CHI-CHI's Fiesta Style Tomatillo Verde Salsa, and guacamole. 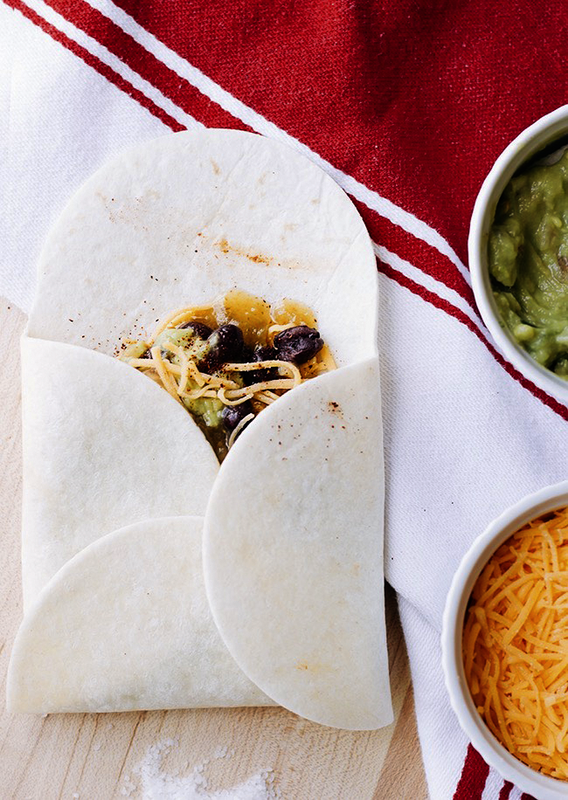 Sprinkle on spices, then fold tortilla sides in and tuck closed (so handy!). Cook each quesadilla over low to medium heat and cook for 3 to 4 minutes, turning every minute, until each side is golden. 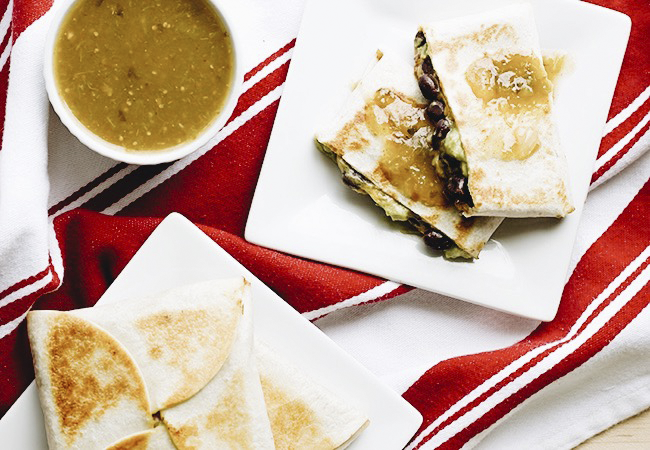 Remove quesadillas from pan and top with CHI-CHI's Fiesta Style Chile Tomatillo Verde Salsa. Eat! 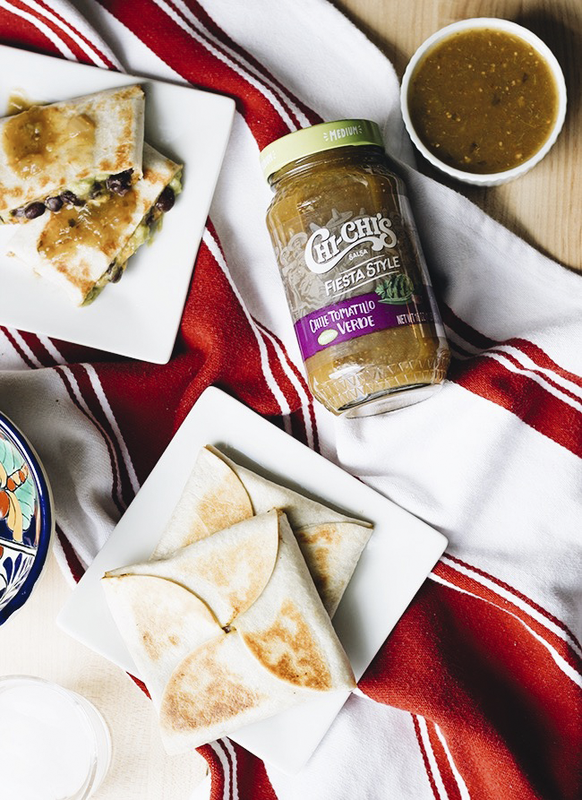 I have been a fan of the CHI-CHI’s® Brand line of yummy, festive, fun Mexican food favorites (like delicious salsas, tortillas, and chips) for years now, but their CHI-CHI’s® Fiesta Style Salsas have taken my adoration to the next level. They're available in Smoky Chipotle, Roasted Tomato, and my fave, Chile Tomatillo Verde Salsa (which has become an everyday staple for me), and they make pretty much every dish better thanks to quality ingredients and flavorful seasonings. Try them on eggs, or on veggie burgers, or mixed into soups. Endless possibilities my friends! And their newest innovation, the CHI-CHI'S FOLDABLES® Tortillas are a game changer. Truly. 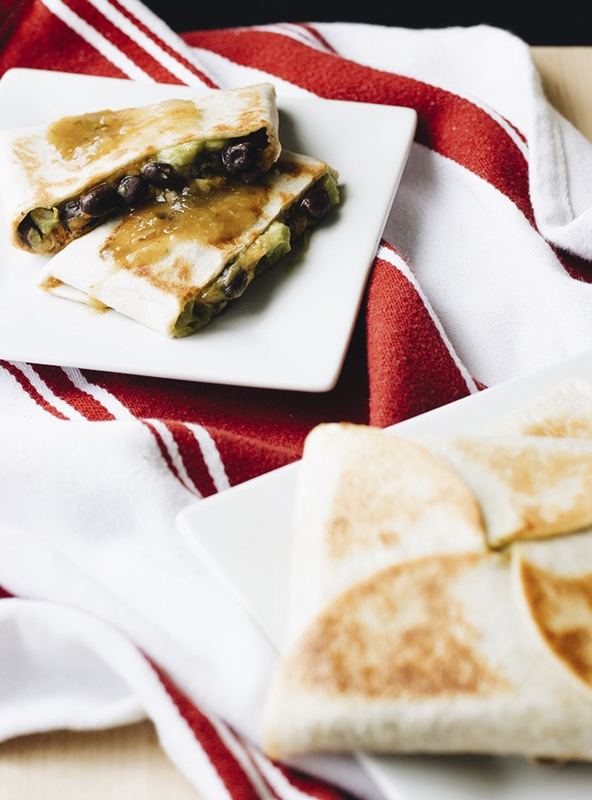 They take ordinary quesadillas up to wrap status, and make the entire process more fun (Bonus points for the fact that they make my children's eating experiences infinitely less messy). CHI-CHI’s is my go-to for gatherings and celebrations too. If you haven't tried CHI-CHI’s head directly to your closest mass-market grocers, including Albertson’s, Walmart, SUPERVALU and Price Chopper, to pick some up. You can thank me later! If you have a favorite quesadilla, I'd love to hear about it. And if you make this recipe, let me know what you think! I saw that salsa at the store. Going to try these. Yum! Not a very articulate way to start this comment, but it is the first thing that came to mind when I read this recipe. I remember the release of the crunchwrap supreme at Taco Bell years ago and how I thought the folded tortilla was absolutely brilliant. I've tried folding tortillas at home but find it is much harder than it seems it should be. Fingers crossed these foldables come to Canada soon, because I would love to recreate this dish, it looks and sounds just delicious.